Welcome to Bubblebou, that is, one of the bubble shows created by Pep Bou, a unique artist when it comes to creating magical shapes out of common and ephemeral soap bubbles. The first of my three day stay at hotel El Paso in Port Aventura amusement park (Salou, Tarragona) it was raining cats and dogs so we had to spend our time in indoor shows. Lucky us! My wife told me we were going to the Chinese pavilion to see something called Bubblebou. No idea. There we were, an off voice was reminding us about the usual "don'ts". No food, no cell phones, no nothing...but thanks God they said they just excluded flashes and spared cameras. So there I went, shooting like mad. 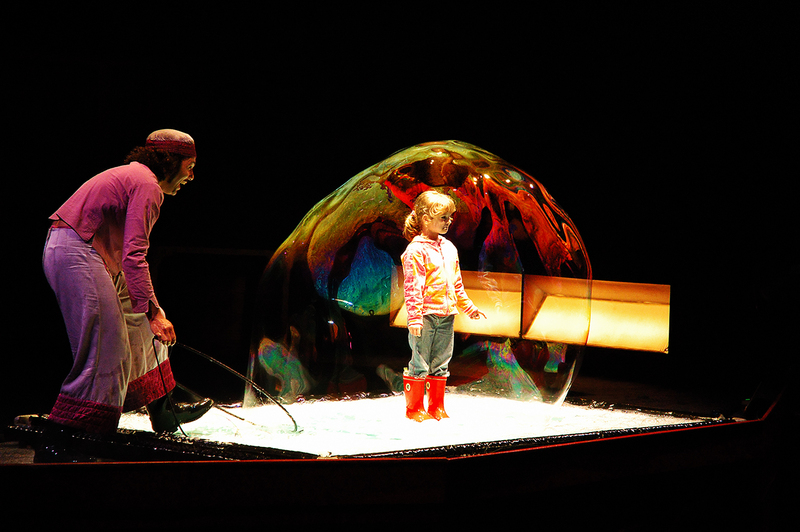 Thanks to that I can share this tender moment with you: A girl from the audience, covered by a gargantuan multicolor bubble and the artist, satisfied by his evanescent creation. Here is a link to Pep Bou's homepage (I couldn't find the name of the man in my photograph who obviously is not Pep but is part of his artistic group). Beautiful colours. Very nice image, good work. I've been wanting to go see Pep Bou's shows, your photos just make it that more inspiring for me to find the time to do it. Beautiful images, Carlos. Great photo! I submitted it to Mixx so it would receive more exposure...I hope that's ok!